In the sixth pre-print article from the upcoming Studies in History and Philosophy of Biological and Biomedical Sciences special issue on psychical research, Chantal Marazia and Fabio De Sio reconstruct the story of the famous “thinking horses” of Elberfeld and their main investigator, Karl Krall. Shortly before the outbreak of World War I, the so-called Elberfeld horses, the counting and speaking animals, were among the most debated subjects of the newborn comparative psychology. Yet, they have left little trace in the historiography of this discipline, mostly as an appendix of the more famous Clever Hans. Their story is generally told as the prelude to the triumph of reductionistic experimental psychology. 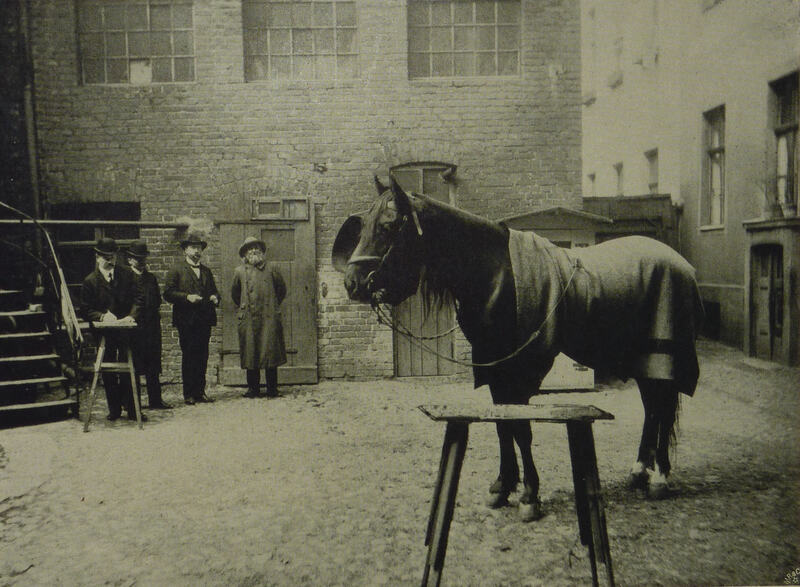 By paying a more scrupulous attention than has so far being done to the second life of Hans, and to the endeavours of his second master, Karl Krall, this article explores the story of the Elberfeld horses as an important, if so far neglected, chapter in the history of experimental parapsychology. Another article from the currently produced special issue of Studies in History and Philosophy of Science Part C dedicated to psychical research is now online as a pre-print version on the journal website. In her analysis of letters on precognition to the British playwright Joseph Priestley, Katy Price (Queen Mary University, London) addresses the complicated relationship between the ‘paranormal’ and psychiatry. Using letters sent to British playwright J. B. Priestley in 1963, this paper explores the intersection between patient-focused history of psychiatry and the history of parapsychology in everyday life. Priestley’s study of precognition lay outside the main currents of parapsychology, and his status as a storyteller encouraged confidences about anomalous temporal experience and mental illness. Drawing on virtue epistemology, I explore the regulation of subjectivity operated by Priestley in establishing the credibility of his correspondents in relation to their gender and mental health, and investigate the possibility of testimonial justice for these witnesses. Priestley’s ambivalent approach to madness in relation to visions of the future is related to the longer history of prophecy and madness. Letters from the television audience reveal a variety of attitudes towards the compatibility of precognition with modern theories of the mind, show the flexibility of precognition in relation to mental distress, and record a range of responses from medical and therapeutic practitioners. Testimonial justice for those whose experience of precognition intersects with psychiatric care entails a full acknowledgement of the tensions and complicities between these two domains as they are experienced by the witness, and an explicit statement of the hearer’s orientation to those domains. In the fourth of eight articles from the upcoming Studies in History and Philosophy of Science Part C special issue on psychical research, Shannon Delorme (Oxford University) takes a closer look at one of the most vocal British 19th-century opponents of spiritualism and animal magnetism, the physiologist William B. Carpenter. This paper analyses the attitude of the British Physiologist William Benjamin Carpenter (1813–1885) to spiritualist claims and other alleged psychical phenomena in the second half of the Nineteenth Century. It argues that existing portraits of Carpenter as a critic of psychical studies need to be refined so as to include his curiosity about certain ‘unexplained phenomena’, as well as broadened so as to take into account his overarching epistemological approach in a context of theological and social fluidity within nineteenth-century British Unitarianism. Carpenter’s hostility towards spiritualism has been well documented, but his interest in the possibility of thought-transference or his secret fascination with the medium Henry Slade have not been mentioned until now. This paper therefore highlights Carpenter’s ambivalences and focuses on his conciliatory attitude towards a number of heterodoxies while suggesting that his Unitarian faith offers the keys to understanding his unflinching rationalism, his belief in the enduring power of mind, and his effort to resolve dualisms. Blog post moved to http://www.forbiddenhistories.com/?p=734. A pre-print version of Richard Noakes’ thought-provoking article looking at the complex relationship between unorthodox and established sciences is now available for download on the website of Studies in History and Philosophy of Biological and Biomedical Sciences. This paper analyses the relationship between the ‘elusive’ science of psychical research and experimental physics in the period approximately, 1870–1930. Most studies of the relationship between psychical research and the established sciences have examined the ways in which psychical researchers used theories in the established sciences to give greater plausibility to their interpretations of such puzzling phenomena as telepathy, telekinesis and ectoplasm. A smaller literature has examined the use of laboratory instruments to produce scientific evidence for these phenomena. This paper argues that the cultures of experiment in the established science of physics could matter to psychical research in a different way: it suggests that experience of capricious effects, recalcitrant instruments and other problems of the physical laboratory made British physicists especially sympathetic towards the difficulties of the spiritualistic séance and other sites of psychical enquiry. In the wake of widely-reported claims that the mediums they had investigated had been exposed as frauds, these scientific practitioners were eventually persuaded by the merits of an older argument that human psychic subjects could not be treated like laboratory hardware. However, well into the twentieth century, they maintained that experimental physics had important lessons for psychical researchers. The second article from an upcoming Studies in History and Philosophy of Science Part C special issue on psychical research is now available as a pre-print version on the journal’s website. Andrea Graus of the Universitat Autònoma de Barcelona investigates the remarkable history of the introduction of medical hypnotism in Spain. Towards the end of the nineteenth century, some Spanish physicians sought to legitimize hypnotherapy within medicine. At the same time, hypnotism was being popularized among the Spanish population through stage hypnosis shows. In order to extend the use of medical hypnotherapy, some physicians made efforts to demarcate the therapeutic use of hypnotic suggestion from its application for recreational purposes, as performed by stage hypnotists. However, in the eyes of some physicians, the first public session to legitimize hypnotherapy turned out to be a complete failure due to its similarities with a stage hypnosis performance. Apart from exploring this kind of hitherto little-known historical cases, we explore the role of spiritists in legitimizing medical hypnosis. At a time when Spanish citizens were still reluctant to accept hypnotherapy, the spiritists sponsored a charitable clinic where treatment using hypnosis was offered. We conclude that the clinic was effective in promoting the use of hypnotherapy, both among physicians as clinical practice, and as a medical treatment for patients from the less privileged classes of Spanish society. Copyright © 2014 Elsevier Ltd.